The Los Angeles Times is first published. The Los Angeles Times is a daily newspaper which has been published in Los Angeles, California, since 1881. It has the fourth-largest circulation among United States newspapers, and is the largest U.S. newspaper not headquartered on the east coast. The paper is known for its coverage of issues particularly salient to the U.S. west coast, such as immigration trends and natural disasters. It has won more than 40 Pulitzer Prizes for its coverage of these and other issues. As of June 18, 2018, ownership of the paper is controlled by Patrick Soon-Shiong, and the executive editor is Norman Pearlstine. In the nineteenth century, the paper was known for its civic boosterism and opposition to unions, the latter of which led to the bombing of its headquarters in 1910. The paper’s profile grew substantially in the 1960s under publisher Otis Chandler, who adopted a more national focus. In recent decades, the paper’s readership has declined and it has been beset by a series of ownership changes, staff reductions, and other controversies. In January 2018, the paper’s staff voted to unionize, and in July 2018 the paper moved out of its historic downtown headquarters to a facility near Los Angeles International Airport. 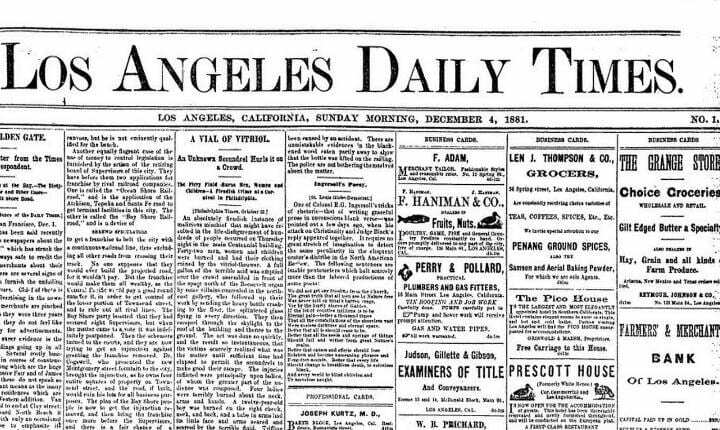 The Times was first published on December 4, 1881, as the Los Angeles Daily Times under the direction of Nathan Cole Jr. and Thomas Gardiner. It was first printed at the Mirror printing plant, owned by Jesse Yarnell and T.J. Caystile. Unable to pay the printing bill, Cole and Gardiner turned the paper over to the Mirror Company. In the meantime, S. J. Mathes had joined the firm, and it was at his insistence that the Times continued publication. In July 1882, Harrison Gray Otis moved from Santa Barbara to become the paper’s editor. Otis made the Times a financial success. Historian Kevin Starr wrote that Otis was a businessman “capable of manipulating the entire apparatus of politics and public opinion for his own enrichment”. Otis’s editorial policy was based on civic boosterism, extolling the virtues of Los Angeles and promoting its growth. Toward those ends, the paper supported efforts to expand the city’s water supply by acquiring the rights to the water supply of the distant Owens Valley. Otis fastened a bronze eagle on top of a high frieze of the new Times headquarters building designed by Gordon Kaufmann, proclaiming anew the credo written by his wife, Eliza: “Stand Fast, Stand Firm, Stand Sure, Stand True. "Every ceiling, when reached, becomes a floor, upon which one walks as a matter of course and prescriptive right." This entry was posted in Uncategorized and tagged 1881, 4 December by Admin2. Bookmark the permalink.